First, I headed to Winn-Dixie to the products I needed for the recipe. 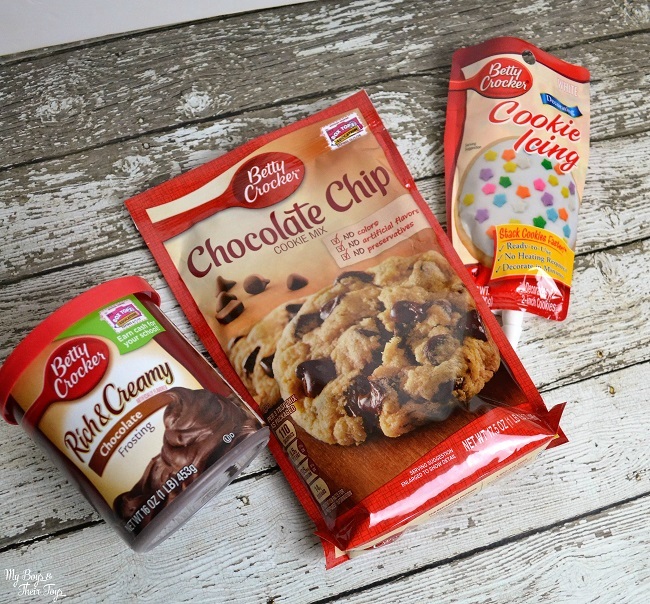 Betty Crocker pouch cookie mixes are on sale 2 for $4 plus fuel perks! And if you buy 3 products, you can use this .75 off coupon too! In a large bowl, beat cookie mix, flour, butter and egg with electric mixer on low speed just until blended. Pour cookie mix into a 12 x 7 baking dish. (I recommend placing a parchment paper baking sheet inside the dish for easy clean-up/transfer.) Bake for 15 minutes. Transfer the cookie bar with parchment paper to a cooling rack. 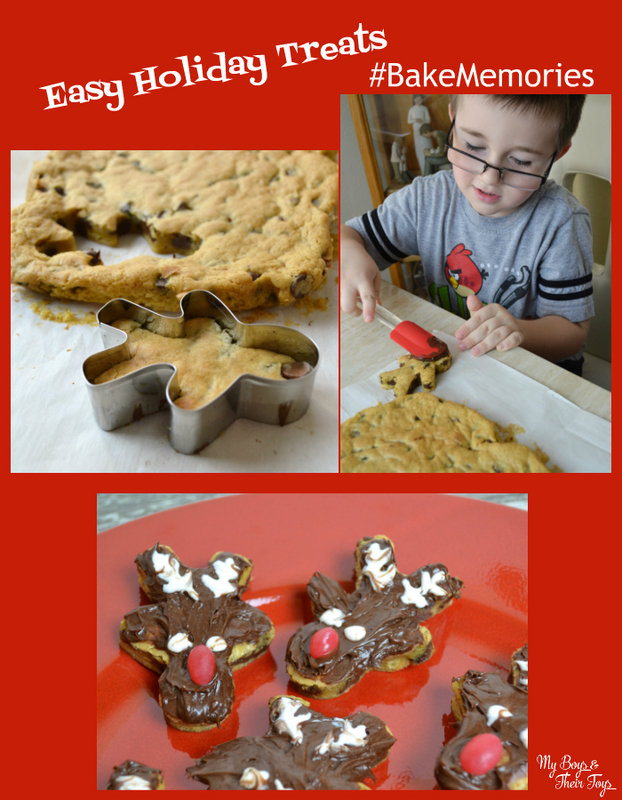 Once cooled, use a gingerbread man cookie cutter to make the reindeer faces. Turn the gingerbread upside down and outline each cookie with chocolate icing. Next, attach candy eyes (or use white icing if unavailable), and add a red candy for the nose. Decorate the cookie bar with white icing to look like icing. Let stand until set, then enjoy! 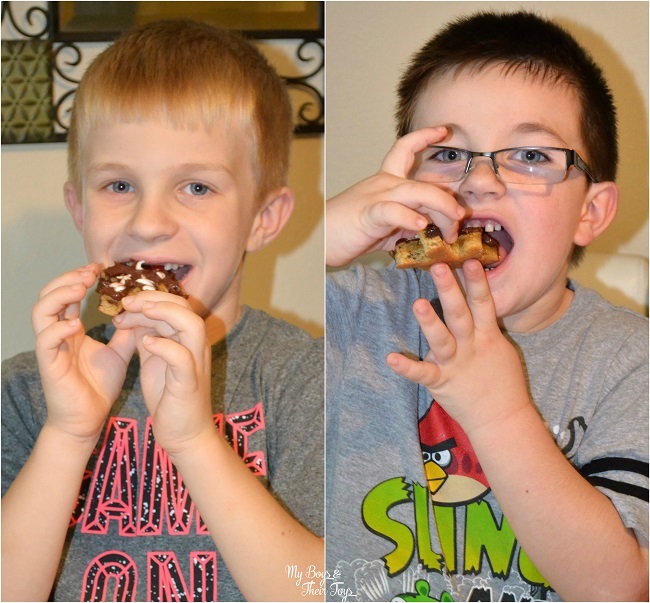 I love to #BakeMemories with my boys! 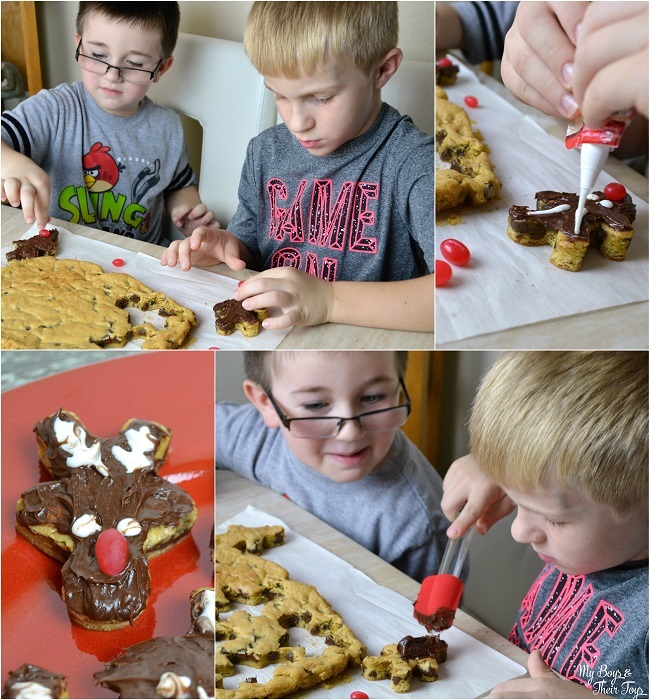 We had such a great time crafting these fun holiday treats. Want to try them for yourself? Let me know how they turn out! Or try one of these 24 Days of Cookies recipes from Betty Crocker. Enter below for your chance to win $10 Paypal cash and enjoy your baking treats on me! I just love cookies- but this year I really want to try the Cake Mix Gooey Butter cookies. They may just be my new favorite this year! I might make the red velvet cookie cups! The Peanut Butter Cookie Truffles look good. I like the Peanut butter truffle cookies. I like the Russian Tea Cakes. My favorite is the candy kissed snowman cookies! The Peanut Butter Cookie Truffles looks amazing! I love Peanut Butter any way so it would be The Peanut Butter Cookie Truffles is right up my alley. I really want to try out the salted toffee bars. The Salted Toffee Bars look amazing! I like the Peanut Butter Cookie Truffles recipe. I think the Candy Kissed Snowman cookies are adorable. We enjoy using the sugar cookie bag to make all kinds of fun cookies during the holiday season. I like the Peanut Butter Cookie Truffles recipe the most. My favorite are the Peanut Butter Cookie Truffles. Thanks for the giveaway! Peanut butter, is always my fave so yummy! RUSSIAN TEA CAKES LOOK DELICIOUS! I want to try the Peanut Butter Cookie Truffles! The Russian Tea Cakes recipe looks good! My favorite cookie would be the Russian Tea Cakes. My favorite would have to be the peanut butter truffle cookie. I would love to try making the classic sugar cookie cut outs! Loving the Christmas Sugar Cookie Cutouts! Classic & so much fun to make as a family! I love the Candy-Kissed Snowman Cookies. They are adorable. My favorite is the Salted Toffee Bars. I really want to try and make the Easy Peanut Butter Cups, listed as Day 8. I want to try the Red Velvet Cookie Cups. I think the Peanut Butter Cookie Truffles recipe would be one of my favorites. Peanut butter cookie truffles would be good. Easy Peanut Butter Cookie Cups are my favorite. My favorite is the Peanut Butter Cookie Truffles. My fave is the Easy Peanut Butter Blossoms recipe. Thanks. My favorite is Peanut Butter Cookie Truffles. I like the classic sugar cookie! Peanut Butter Cookie Truffles looks yummy! I love the cake mix gooey butter cookies! I like the Red Velvet Cookie Cups. Red velvet cookie cups look so good. I like the peanut butter cookie truffle recipe on their site. 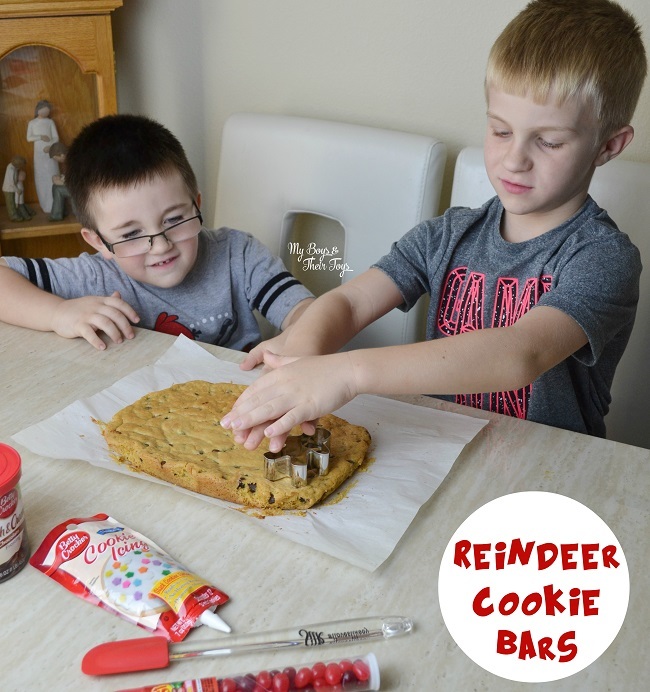 I love these reindeer cookie bars! I think the kids and I will try these. Thank you for the great idea! Those cookies turned out so cute and look absolutely delicious!! Great idea! !